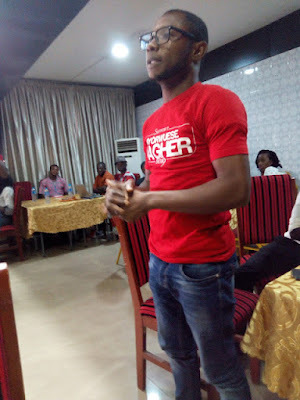 OAPs, Bloggers, Media Executives, Influencers, Photographers and Writers, recently came together in Abuja to let their hair down and socialize while still discussing the Nigerian state and the role of the media as "Watchdogs" of the society. While eating and networking, The tone of the discussion centered around balancing stories that are thrown up by the social media many a times without verification. Some of the journalists present stated that the political arena was no tea party and that credible candidates must emerge with a formidable game plan, taking factors such as thuggery, money politics, voter bribery and so on, into consideration, if they are to make any headway. In attendance was leadership expert, Magbitse Barrow who recently pitched his hat in the ring announcing his intention to run for office as House member representing Bwari Area council of the FCT. He noted that most forward thinking Nigerians were not interested in vying for office as they were so busy building their own private empires and get out of the cycle of poverty, so they could live better lives. Some of the Media personalities present reiterated that even Journalists and Creative must #GetInvolve in delivering a saner Nigeria. Present at the event were Bobby Alasoadura of Meets Media Lagos, Media Strategist and Top Event Compere, Victor Agbenson of Radio Nigeria, Media Strategist and Abuja Favorite female Compere Petra OBlack Ologundudu, Ade of HotFM, Voice of Nigeria and other Analysts, OAPs, Online and offline commentators networking and discussing admits a very relaxed atmosphere. One of the highlights of the night was when internationally acclaimed Theatre Icon and Former Ambassador of Canada and Mexico, Professor Hagher Iyorwuese, took the stage saying that "decade old conspiracies of Silence denials and conspiracies had finally been exposed" to the international press and community as pictorial evidences of gory massacres and monumental loss of lives continue to emerge from the middle belt of Nigeria. He also vehemently stated that after sitting and watching the trend of the political arena, he had grown sick and tired of being sick and tired. He asked all to join him as he continues his race towards the first office of the nation, even as the Tiv nation had anointed his presidential candidature in the 2019 race. The Event was hosted by Solid Base Production, Abuja.